Yesterday and today, I had the pleasure of attending the Partnership for a Healthier America (PHA) Summit. PHA is devoted to working with the private sector to ensure the health of our nation’s youth, and their annual summit is a gathering of leaders from public, private, and non-profit organizations, all committed to solving the childhood obesity crisis in America. 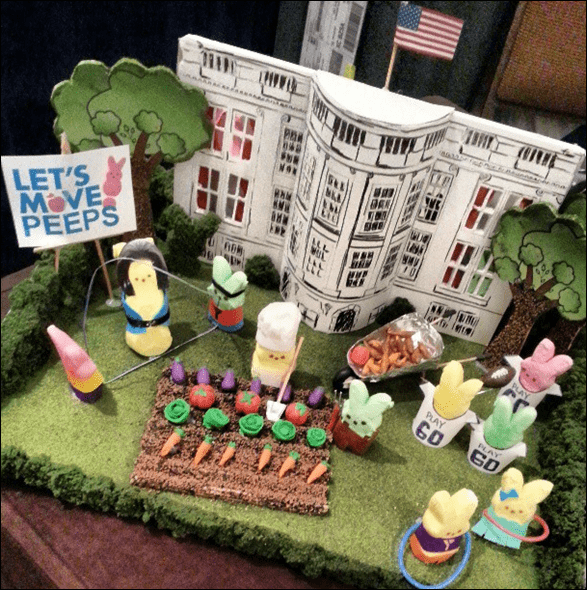 “Let’s Move” Peeps display from the reception last night! So cute. Considering I just wrapped up my Masters of Public Health in Nutrition in December, it was a huge honor to be at an event with so many of the leaders in the field – many whose programs we learned in detail about during grad school – and lots of fellow Registered Dietitians, too! I actually met a couple other UNC MPH-Nutrition alumni last night at the reception, and on the bus to the keynote speeches today I found myself sitting next to the Associate Executive Director of the Center for Nutrition Policy and Promotion – the people who develop and promote the dietary guidelines, MyPlate, etc! 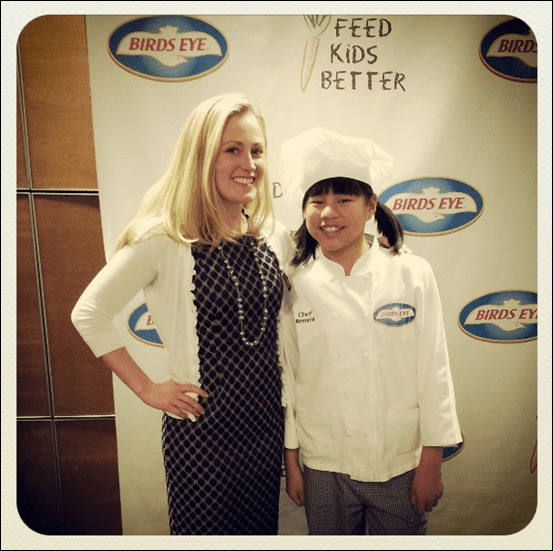 I was invited to the event as a member of the press by Bird’s Eye, one of the event sponsors. They hosted a private event yesterday with some fellow RDs to share and discuss some of the advances they’ve been making towards getting kids eating more veggies! Did you know that 80% of veggies are eaten at dinner, but only 1/3 of dinners actually have veggies? Remmi shared with us that her mom got her and her sister interested in veggies by introducing them in a fun way, experimenting with different veggies and seeing what they liked, but not forcing anything on them. One of the other big highlights of the event was the farewell speakers this afternoon. 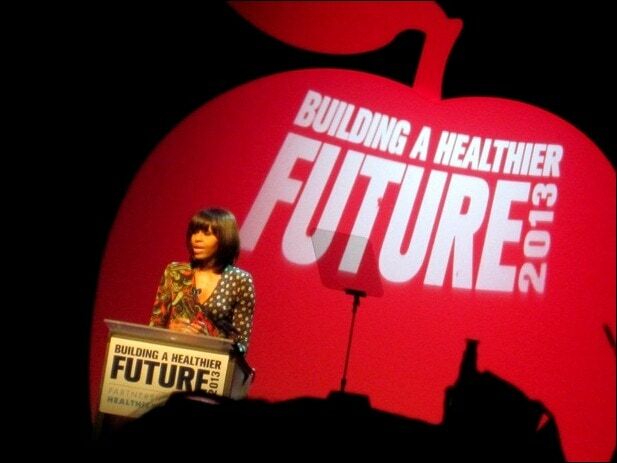 First lady Michelle Obama, who is the PHA’s honorary chairwoman, was the keynote speaker. What a treat to see her speak in person! I’ve been so impressed with her efforts towards making America healthier, and she was engaging and very well spoken. Truly a wonderful role model… and the bangs were looking fierce. I was especially interested to hear about BOKS, which is a before school physical activity program supported by the Reebok foundation that is designed to jump start kids’ brains and prepare them for a day of learning. The program combines play, physical activity, team games and short talks on nutrition to create healthier habits for children to achieve life-long fitness; BOKS typically starts an hour before school and runs two or three mornings a week. Kathleen Tullie started BOKS, originally called “Fit Kidz Get Up & Go,” in October of 2009 in MA. She originally approached Reebok for a t-shirt sponsorship, and the relationship later turned into a collective mission to provide opportunities for children to have healthy bodies and minds. What an amazing program! As you know, I’ve worked with Reebok a lot through my blog and I’ve always been impressed by their efforts towards national health and wellness as a brand. It’s been quite the past couple days, as you can see. A big thank you again to Bird’s Eye for the opportunity to attend the PHA Summit. It was an honor to be there! Next article: EX2 Adventures Backyard Burn Trail Race + Hiking! That is so cool that you were able to see the FLOTUS speak! :) Looks like a great day! Really neat, Anne. What a thrill that had to be. And a great cause/focus! Very cool! as a mom to 3, this topic is very near and dear to my heart. I’ll do pretty much anything to get more vegetables in my kids!!! Love this. My advisor from college posted on Facebook about shaking Mrs. Obama’s hand today! Fantastic event to be a part of! I love the BOKS idea! I have done events at few schools that have the kids out walking around the playground every morning after breakfast (the entire student body eats breakfast together at these schools). Love that they get the fresh air and some activity to jump-start their minds and bodies! Haha he was cute and well spoken! What an awesome experience!!! Being an RD like you, this is a topic that I’m extremely interested in. It’s awesome that you’re having an upfront, proactive experience like this! Thanks for sharing! I’m so thrilled for you that you got to go to this! How fun. I wish I could have been a fly on the wall. :) kisses! 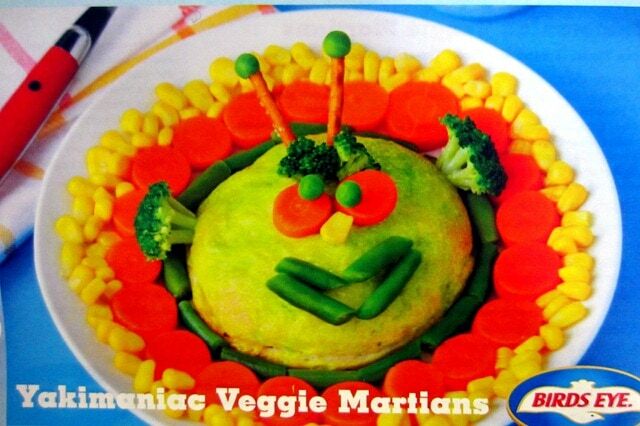 I love that veggie statistic! And the fact that you got to see Michelle Obama :) What a great advocate for our field!